We met… in a pub in Cork City called Mutton Lane. I was out with a friend of mine, Michelle, who had just returned from the U.S. She was telling me all about her wedding in Las Vegas. The pub was pretty full. Gar (Gearóid) was meeting some friends who were heading off to South Africa the next day to follow the Lions Tour, but luckily for me, he had decided he wasn’t going! We both went for the same shelf space to rest our drinks, and got talking. Our proposal… We were in Galway City on a romantic weekend break. I had a feeling…but didn’t really let myself think about it, just in case I had misread the signals! Ireland had beaten Australia in the Rugby World Cup that morning (Gar took that to be a good omen!) and we were both delighted. I suppose it should have been obvious that something was going on when Gar downed a full pint of Guinness during dinner. He dropped down on one knee at the Spanish Arch. We spent the rest of the night grinning like two eejits in our own little world. It was brilliant. Emma’s first impressions of Geroíd… Gar has piercing blue twinkly eyes that I felt I had seen before. It turns out we’d been in college in U.L. together for four years, but had never known each other. I was seriously interested in this shy Clare man, but was expecting a girlfriend to arrive. How could someone like him not have been snatched up? Turns out I have the GAA to thank – he had just retired from hurling and no longer trained six nights a week! Geroíd’s first impressions of Emma… There was a definite glint in her eyes as she was hovering over some premium bar space in the packed Mutton Lane pub. I reckoned she must have had a boyfriend or even have been married… she was too good looking to be single! I managed to get chatting – low and behold we had both been in college in UL at the exact same time. More chat followed and a trip to Crane Lane where I had to do a few laps of the place trying to find her. That night Em was beautiful, funny, sharp and a keeper! So I played my cards right and the rest is history. My dress… I find it hard to enjoy myself unless I’m wearing something I feel comfortable in, so it was obvious from the outset that I wouldn’t have the patience for a long, heavy dress. Though I tried plenty of different styles, I knew a tea-length gown was ideal for a long day and an even longer night of partying. 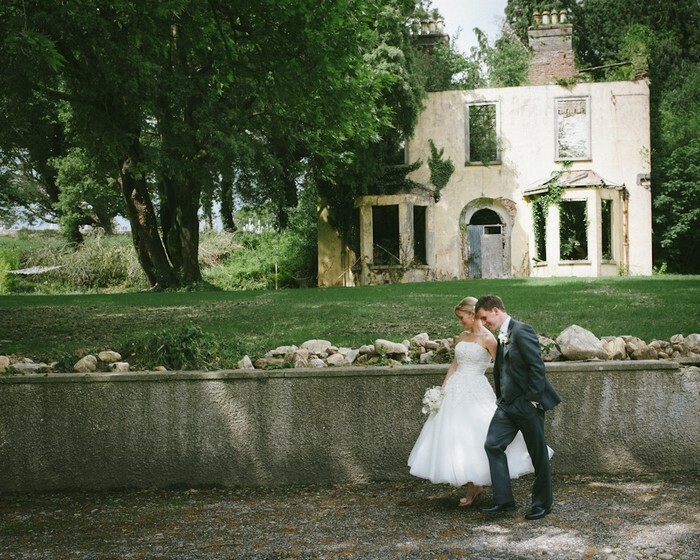 I adored the dress I chose in Amore Mío, Killaloe – a Justin Alexander tea-length in ivory. It had that Grace Kelly look about it. Did I mention how much I loved my dress?! Our ceremony… We got married in the church beside my primary school, where I had made my communion and sung in a school choir many years before. It’s a small church with lovely grounds. The locals did a really great job getting everything ready, painting gates and cutting lawns. We were allowed choose whatever music we wanted, and we were really grateful for that. Some of my sister’s friends and a local music teacher performed our favourite songs. They were absolutely amazing. I walked up the aisle to ‘All I Want Is You’ from the Juno film soundtrack, and walked back down as a married woman to ‘You Got the Love’. My favourite part of the wedding day…. Walking up the aisle with my dad was really special. After communion, Amy, my sister and bridesmaid, and Cathal, one of our groomsmen, did a rendition of ‘Your Song’ together. That was really emotional. I loved every minute because all our family and friends were together in one place, celebrating with us. Our DIY wedding… It was a family affair! I may have taken on a bit too much, but my mam helped me cope. Making the invitations was very enjoyable, but time-consuming. I didn’t really want any shiny or metallic colours, so finding the right paper was tough and deciding on the design was even tougher! You’re putting your (lack of) creativity out there for everyone to see. I had this image in my head of how the hotel would look, and it actually ended up looking just how I had pictured it. We chose our photographer because… Gar and Rory (Rory O’Toole Photography) had been colleagues in the same company and we knew he was a really sound guy with a style that we really liked. When he became professional, we knew he’d be the perfect wedding photographer for us. On the day, he knew exactly what shots we’d like: a bit off-beat and nothing too stiff or formal. Our wedding theme/colours… I hoped our guests would feel they were at a garden party. Lemon and pink were our colours. I love the summer, and chose a strong lemon colour for my three sisters’ vintage –inspired bridesmaid dresses. The groomsmen wore grey suits and lemon ties. There were accents of pink here and there (ribbons, flowers, etc.) I wore dusky pink shoes! We placed garden lanterns with candles and enamel jugs with flowers on the tables, along with china teacups, some holding flowers and others with tealights in them. My mam and I had spent a few months treasure-hunting in second-hand shops and it paid off. I collected the lanterns and jugs over a few months. We also had pink, lemon and white paper lanterns hanging from the ceiling, to give the hotel function room a more outdoor feel. The hotel staff spent ages helping us get everything just right that day before. And my parents worked so hard to make everything look great, they made it all happen for us. Our wedding cake was made by both our mothers – Gar’s mam made the cake itself and my mam decorated it. It had lemon flowers and looked too pretty to cut. “My mam and I had spent a few months treasure-hunting in second-hand shops and it paid off. We chose our venue because… the location was perfect. Years before, I’d had a summer job there and had been to many discos and debs in its function room. It felt like home. In fact, we didn’t even look at any other hotels, I knew the Brandon House was perfect. Another big plus was that it had enough rooms to accommodate a large number of our guests. Convenience was important to us. Our honeymoon… We decided to visit Cuba, and to see as much of it as possible. We felt that it’s a unique place that will probably begin to see lots of changes in the next few years and I’m a Spanish teacher, so I could practise my language skills with the locals. It wasn’t a luxury pool-side holiday though. We had a few days in a 5-star Havana hotel and a few more in a beach resort, just to recharge the batteries, but the rest was adventure on the open road. The photo opportunities were endless and I ended up taking over 2,000 pics. Gar drove our rental car over 1,800 kms of really bad roads from one end of the island to the other. We visited Santiago de Cuba during a local festival and went pony-trekking through a tobacco plantation on the other side of the island. What an adventure! My piece of advice for other brides… Keep a record of all the gifts you receive. Gar was better than me at keeping track and it made sending the thank-you cards a lot easier, even if they were still quite late getting there! It’s a nice touch to refer to the specific gift you were given as well. I love the tea party in a garden theme. The colors and over appeal of the wedding are so beautiful. What a gorgeous looking wedding…love all the little details.. Would never have the confidence to put pale lemon with pink but it works.. Sweet as candy! Absolutely stunning wedding.. I went to secondary school with Emma, and she has always been a beautiful looking girl.. she looks so happy and her wedding looks amazing Funny enough I have chose yellow and silver for our spring wedding next February, so was delighted to see these pictures and how well it looks on camera. Gorgeous wedding can’t wait to have ours this summer in the Brandon. Where is the beautiful old house located in the photographs? Is it near New Ross? ?